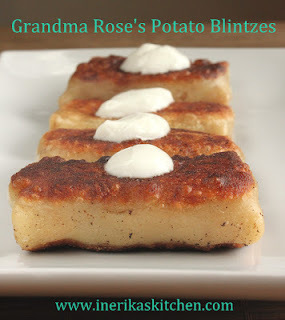 My Grandma Rose, may she rest in peace, made the best potato blintzes in the world. The filling: soft mashed potatoes generously laced with sweet caramelized onions. The pancakes: thin, but not too thin. Definitely not delicate like French crepes - Grandma Rose's blintz wrappers had some bite to them, some heft, some chew. 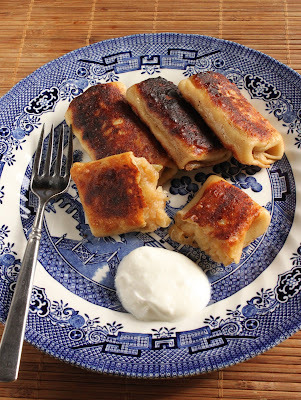 She'd wrap up the potato blintzes into little packages and pan-fry them in butter until each side was crisp and golden brown. She'd serve them with sour cream, maybe a dish of applesauce. We never could get enough. When the Idaho Potato Commission asked me to come up with some recipes using Idaho potatoes to celebrate Hanukkah, I thought immediately of Grandma Rose's potato blintzes. On Hanukkah, the Festival of Lights, we eat fried foods to remind us of the oil that kept the candles burning in the Jewish temple in Jerusalem for a miraculous eight days. Potato latkes (pancakes) get most of the attention, but that's not the only way to celebrate Hanukkah. Making potato blintzes is a multi-step process, but it's well worth the time. You can start with leftover mashed potatoes (hello, Thanksgiving) or even use Idaho dehydrated potato flakes (a miracle product if ever I saw one). Once you've got the wrappers made and the blintzes assembled, you can store them in the refrigerator for up to 3 days before frying them off. Just lay them on a parchment- or foil-lined baking sheet in a single layer and cover with plastic wrap - they'll be good as new once you pan-fry them. My Grandma Rose has been gone 16 years, but one bite of her famous potato blintzes and I can feel her arms around me again. What about you - do you have a family recipe that brings your loved ones back to you? My Grandma Rose made the best potato blintzes in the world - crisp buttery pancake on the outside, soft mashed potatoes laced with caramelized onions on the inside. Top them with a dollop of sour cream before serving. Make the filling: Put the Idaho® potatoes in a saucepan and cover with cold water. Bring the pot to a boil, turn down the heat, and simmer until the potato chunks are tender and easily pierced with a fork, about 20 minutes. Drain the potatoes and put them back in the hot, empty saucepan to dry for a few minutes.While the potatoes are boiling, heat 4 Tablespoons butter in a large skillet and add the onion. Cook until the onion is golden brown and very soft, about 15 minutes.Mash the potatoes with a potato masher or fork; it's okay if there are some lumps. Add the cooked onions, salt and pepper. Mix well, taste, and adjust seasoning if necessary. Set filling aside.Make the pancakes: Whisk together the flour, egg, water and salt. The batter should have the consistency of heavy cream; if it's too thick, whisk in a little more water.Heat a small (7-inch) nonstick skillet over medium heat. Melt a little knob of butter in the pan and swirl it around so the bottom of the skillet is lightly coated with the melted butter. When the butter stops foaming, ladle in about 2 Tablespoons of the batter, swirling the pan around so the batter coats the bottom of the skillet evenly. Cook the pancake about 45 seconds, until the edges are starting to curl up. Do not flip the pancake - you're cooking it on one side only. Slide the pancake onto a plate, cutting board or cooling rack. Repeat with the remaining batter until all the pancakes are made. Wait to stack the pancakes until they are fully cooled or they will stick together.Assemble the blintzes: Place one pancake on a cutting board with the cooked side up. Dollop about 2 Tablespoons of the potato filling in a rectangular shape in the middle of the pancake. Now form the blintz by folding in two sides of the pancake over the short edges of the rectangular filling, folding up one long edge, and rolling until the other edge is under the filling and the whole package looks like a little burrito. Continue with the rest of the pancakes and filling. Note that the uncooked side of the pancake is on the outside of the blintzes; this is as it should be, since you will be cooking the blintzes again once they are formed.To serve, heat a little more butter in the skillet and place the formed blintzes in the skillet. Fry until golden on both sides and the filling is heated through. Serve immediately with applesauce or sour cream (or both).Time-saving tip: 4 cups Idaho® dehydrated potato flakes plus 2 cups boiling water may be substituted for the cooked and mashed potatoes in the filling. Mix together the potato flakes and the boiling water, then proceed with the recipe as directed. Blintzes can be formed up to 1 day ahead and refrigerated, stored in a single layer and covered tightly with plastic wrap. Your "Grandma Rose"....In my case it was "Grandma Belle". Truly my soulmate relative. We're both blessed for having exquisite grandma connections.